exhaust system is as clean as possible. guarantee customer satisfaction and full compliance with federal and state health requirements! that you are well within all the legal standards for your business before something terrible happens! restaurants haven͛t made the switch to Los Angeles Hood Cleaning! 1. You could break your lease agreement. system. if you don͛t, the leaser can sue you or evict you without notice! 2. You can prevent roof damage. roof, which can cause weakening and deterioration well before the roof should need to be replaced. 3. You can protect your workers and customers. problems for you and your employees by maintaining a clean exhaust system. You can rely on us to service your hoods to code, and full satisfaction, on time. We never cut corners, and the exhaust vent between stove top and rooftop is no exception. Your equipment is a huge investment. Save time and money by letting us clean them inside and out. 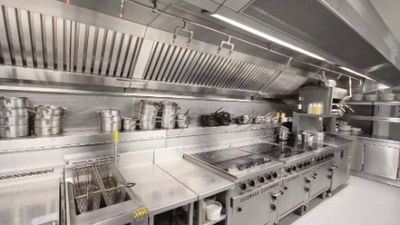 In commercial kitchens, a sanitary environment is key. We have the expertise to bring your kitchens back to life.